The NBA regular season is just one day away from officially beginning. There's a lot of excitement and anticipation for all 30 teams. Here are some burning questions which can be answered during the course of the season. Let the games begin! 1. Can the Dubs Repeat? 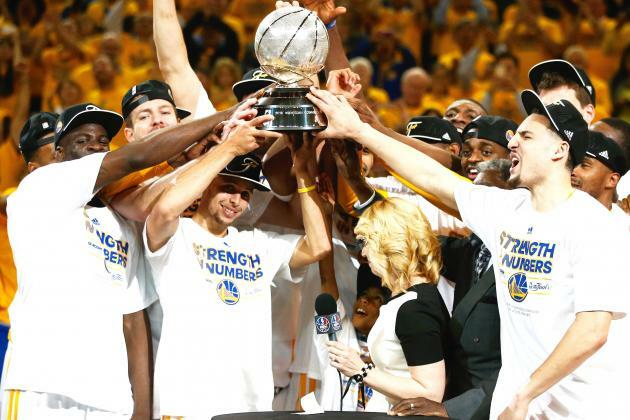 Winning back-to-back rings is no easy feat in the NBA. Even the mighty San Antonio Spurs have not won consecutive titles. I'm not saying that the Dubs cannot win a second straight ring but it's very difficult especially when opposing teams bring their "A" games against them every night. It also hurts them that Coach Steve Kerr is ailing and his return from a back injury has no timetable. The Warriors could lose a few extra games during Kerr's absence and that could be the difference in deciding home-court advantage in the stacked Western Conference. The Dubs used home-court advantage to its fullest last season as they finished with a 39-2 record at the Oracle Arena during the regular season. GSW can repeat as champs but I'm not banking on that happening. 2. Will Kobe retire after this season? Kobe has a 1-year contract worth 25 million USD. He has played a total of 41 games in the last 2 years due to various injuries. This upcoming season will be his 20th year in the NBA. He has about 1500 games under his belt including the playoffs. This guy has nothing else to prove to us but he probably wants to prove something to himself. Getting a 6th ring to tie Michael Jordan might be up there among his career goals but that ain't happening anytime soon with the LA Lakers. Instead, Bryant might be thinking about chasing the overall points leader in NBA history since he sits at 3rd, behind Karl Malone and Kareem Abdul-Jabbar. Kobe needs to play roughly at least 2 more seasons to realistically surpass "The Mailman" so, if that is his goal, then expect Kobe to NOT retire after this season. However, another injury even a minor one, and a miserable season with the Lakers might force Kobe to retire. Additionally, the Lakers may not be willing to pay him 25 million or more next year and I'm not sure Kobe's ego can take the reduced salary. 3. Who will challenge the Cavs in the East? The Cleveland Cavaliers are the favorites to come out of the East because they still have LeBron James, Kyrie Irving and Kevin Love in their lineup. Their biggest enemy has to be injuries and more injuries. It's early but LBJ missed parts of training camp already due to injury and Kyrie Irving still has no definite timetable on his return. Let's not forget that Iman Shumpert is still weeks away from being cleared to play. Anderson Varejao is still with them and we know how fragile this guy is when it comes to getting hurt. IF everyone stays healthy, the Cavs can hit 60 wins. The rest of the East is simply playing for the #2 seed and below. However, a couple of teams can give the Cavs a run for their money and those two are the Chicago Bulls and Miami Heat. 4. Which player can bounce back from injury the fastest? It was no secret that a lot of very good players were lost to season-ending injuries last season. Here are some names: Kevin Durant, Chris Bosh, Kobe Bryant, Kevin Love, Brandon Jennings, Wes Matthews, Jabbari Parker and a lot more. Who among them can regain their elite status before their injuries robbed them of a full season? My money goes to the 2013-2014 former MVP Kevin Durant. KD had foot problems last season and there were rumors that his Nike personal shoe played a role in that incident. 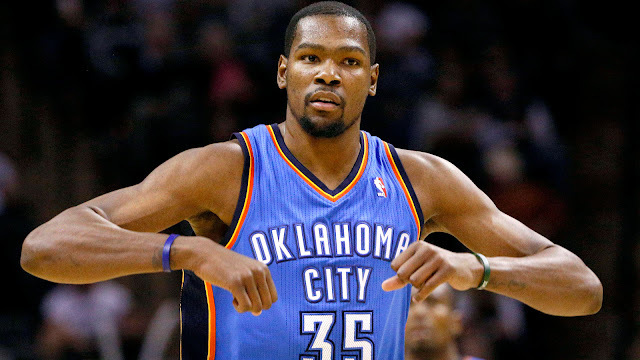 Anyway, Durant shot extremely well from the field during preseason (about 60%) which bodes well for his recovery. It also helps that Russell Westbrook is his teammate so that gives KD more time to acclimate to game conditions. On the other hand, Kobe Bryant and Chris Bosh somewhat struggled during the preseason. Part of that is the expectation to lead their teams in scoring and another part is their reliance on shooting jumpers. 5. Is Aldridge a "perfect fit" for the Spurs? LaMarcus Aldridge joined the Spurs and somewhat went back home to the state of Texas during the summer. He was arguably the biggest off-season acquisition in the NBA. Aldridge also improved an already loaded Spurs' team. Now, can LMA fit their system? Absolutely! While it was rumored that LMA did not like how the Blazers anointed Damian Lillard as the "man" in Portland, LMA is quite willing to be treated equally in the Spurs' locker room. His offensive skills also coincide with how the Spurs play ball: unselfish and team-oriented. LMA can be the focal point of the offense in pick and roll/pop sets and he can also operate in the low post. However, Aldridge is not yet a very good defender so that is one aspect that he needs to improve on. Luckily for him, Tim Duncan is still playing and TD can definitely tutor LMA. The Spurs have the biggest potential to unseat the Warriors in the West. 6. Will the Clips emerge in the West? The LA Clippers have failed to reach at least the Conference Finals in the last few years because they always lacked bench support. Their starting five has always been solid and they have Jamal Crawford as the perennial sixth man but it typically stopped there. The same cannot be said this season because they finally have a loaded bench. Yes, you read that right! 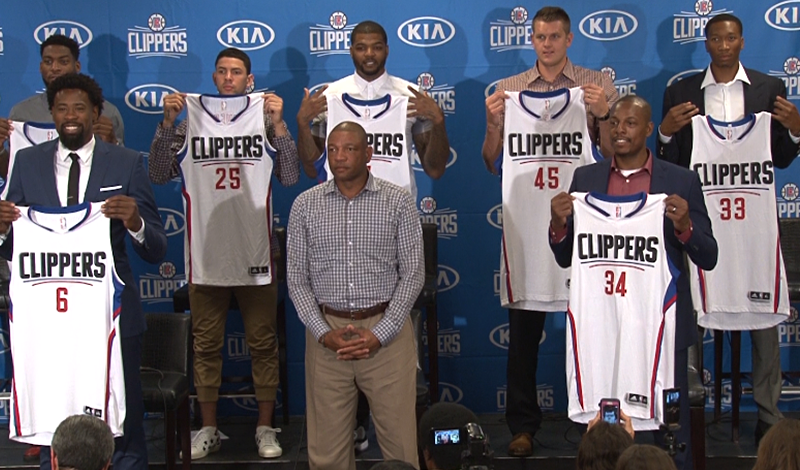 They now have Josh Smith, Paul Pierce, Lance Stephenson, Wesley Johnson and Luc Mbah a Moute. The Clippers can play up to a 10-man rotation and their biggest acquisition was the "return" of DeAndre Jordan. Now, it is up to Coach Doc Rivers to utilize his bench and give confidence to his guys. Of course, he needs to play them which Doc does not routinely do. 7. Can the T'wolves compete for a playoff berth? The T'wolves had a miserable 2014-15 season. They only won 16 games and they endured a rash of injuries to key players. On the bright side, they got rid of Anthony Bennett and they drafted Karl Anthony-Towns to be their starting center. Sophomore Andrew Wiggins seems ready to take his game into another level and Zach LaVine is chomping at the bit to play his natural position as SG instead of PG. It also helps that the veteran, Andre Miller is in town to be the primary backup of Ricky Rubio in case Rubio gets hurt again. Speaking of veterans, Kevin Garnett is back for another year and his impact and influence on the young guys can never be understated. Lastly, the untimely demise of Coach Flip Saunders could ultimately inspire and unite them together. The team will definitely dedicate this season for Coach Flip and that could be a springboard for more wins and maybe a slot in the playoffs. 8. Can the Sixers win at least 20 games this season? The Sixers won 19 games two seasons ago and 18 games last season. They are perennially near the bottom (or at the bottom) of the standings and various power rankings. Their 1st round pick last season, Joel Embiid has yet to play a game in the NBA and he might miss another year with foot problems. His biggest flaws are poor attitude and lack of a decent work ethic. The Sixers drafted another big guy to compensate for Embiid, that guy is Jahlil Okafor. By early accounts, Okafor is the complete opposite of Embiid when it comes to working hard and preparing for the season. The main concern of the Sixers, can Nerlens Noel and Okafor play together? Both guys can operate in the low post, Noel is a better defender while Okafor is a more polished scorer. However, neither has a reliable mid-range jumper. The rest of their lineup does not scare others and there are rumblings that the Sixers are headed for another "rebuilding" season, also known as "tanking". It's very doubtful that winning 20 games is achievable. It may not even be a goal for this team. Losing translates into lottery picks. 9. 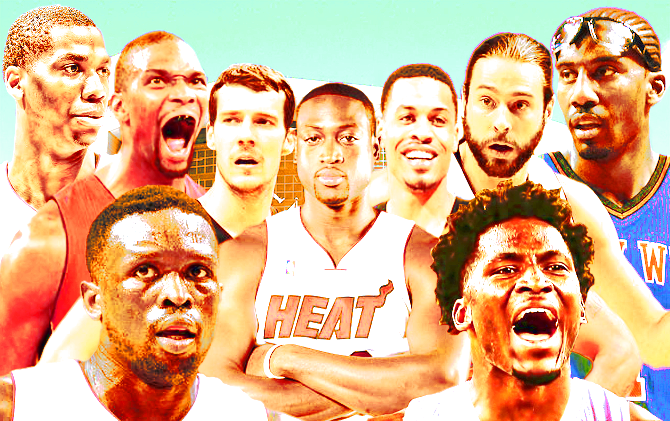 Is the Miami Heat a contender again? During the era of LBJ in Miami, the Heat participated in the NBA Finals for 4 straight years. Last season, they missed the playoffs. They appear to be back with a vengeance this season especially with the return of a healthy Chris Bosh who will get a chance to play with Hassan Whiteside and Goran Dragic more often. To add more depth, Amare Stoudemire, Gerald Green and rookie Justice Winslow will spearhead their second unit. Overall, the strength (or weakness) of Miami still depends on the health and availability of Dwyane Wade. D-Wade missed at least 20 games in the past 2 seasons and if he misses anything close to that number, Miami could be in trouble. However, it has been reported that Wade entered training camp in the "best shape" of his career so things look very optimistic early on for Miami. They have the talent and coaching experience to battle the Cavs at the top of the East if everything falls into place for them. 10. Which five teams should be automatic League Pass games to watch? This has to be the toughest question since there are definitely more than 5 teams which are always good enough to watch on NBA League Pass or on TV. That being said, the 5 most exciting and most entertaining to watch IMHO are (in no particular order): Golden State Warriors (crazy handles and threes), LA Clippers (dunks and alley-oops), OKC Thunder (Russ is a force of nature), Cleveland Cavaliers (LBJ and company) and the San Antonio Spurs (team play is attractive). I will also include the Miami Heat as my personal favorite. Honorable mentions go to the Houston Rockets (The Beard), New Orleans Pelicans (The Brow), Toronto Raptors (my "home" team) and Chicago Bulls (Whose team is it? ).